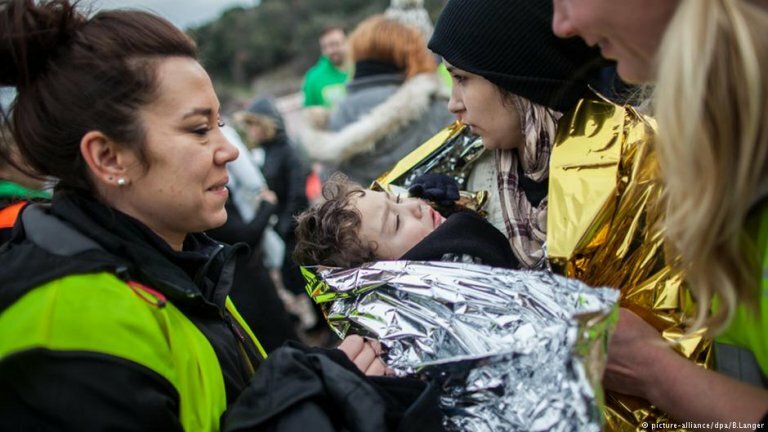 Volunteers help migrants arriving on Lesbos. The founder of a refugee organization in Greece has been arrested on the island of Lesbos. Four other members of the NGO, including Syrian refugee Sarah Mardini, have been in detention for several weeks, accused of helping migrants enter the country illegally. Panos Moraitis, who set up Emergency Response Center International (ERCI), had been in hiding for three weeks before giving himself up to police on Wednesday. He is expected to appear in court on Friday. Moraitis and 29 other members of the NGO are accused of helping people smugglers and seeking advance warning of migrant arrivals without passing on the information to authorities. ERCI's field director Nassos Karakitsos, program director Mirella Alexou and two volunteers, German-Irish national Sean Binder and Syrian refugee Sarah Mardini, were arrested last month and have spent weeks in pre-trial detention. 23-year-old Sarah Mardini and her sister Yusra made news headlines in 2015 when they swam to shore on Lesbos pulling a leaky boat with 18 migrants onboard. They have since settled in Germany, but Sarah has continued to volunteer for the Greek NGO. Yusra, now a UNHCR goodwill ambassador, was on the refugee team at the Rio 2016 Olympics, while Sarah has a scholarship to study at Bard College in Berlin. ERCI has denied the charges against its members. "My client is just a helper and has nothing to do with the charges," Sarah Mardini’s lawyer Charalambos Petsikos said. "It is an attempt to criminalize the activity of helpers," he added. Mardini is expected to remain in detention in Piraeus, outside Athens, until at least Monday. Earlier this year, three Spaniards and two Danes were also accused of trying to help migrants illegally enter Greece. A court cleared them in May.